TSB guarantees its customers will not lose out to fraud. How relaxing is a 'sound' bath? Plus the government's attempts to shut down a storage company called Store First. TSB has announced today that it's become the first bank to guarantee its customers won't lose out to any sort of fraud. It means that TSB customers tricked into sending money to criminals will be covered in a way they haven't been before. In the past people who've been scammed in this way have often been refused refunds by their bank because they authorised the payments, and have been held partly to blame. We speak to Ashley Fraud, TSB's Head of Fraud, about what his customers can now expect from the bank's new guarantee. Our reporter, Geoff Bird, explores what it's like to take a 'sound bath'. It's a new way of relaxing, replacing hot water with the sound of gongs, chimes and singing bowls. 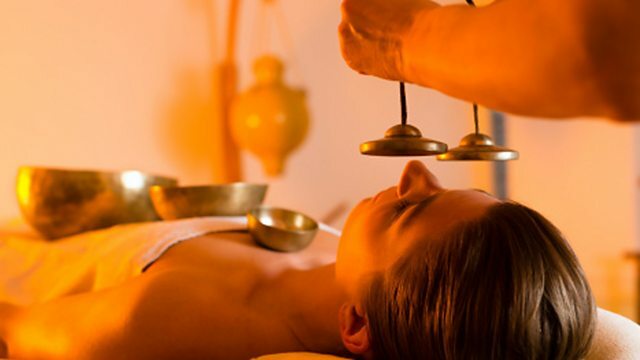 He visits a gong spa in Romiley, near Stockport, to talk to the 'gongsmith' there along with customers who are paying to attend to help remove the stress from their lives. We report live from the High Court about the government's attempts to shut down a storage company that's taken millions of pounds in pension investments. Store First based near Preston in Lancashire promised big returns to investors who bought thousands of individual storage units inside warehouses it operates around the UK. The returns haven't materialised, and many people believe the units they bought are worthless. After an investigation by the Insolvency Service, the Secretary of State has petitioned the courts to wind up the companies involved. Store first says it operates a successful business, and will vigorously defend itself.